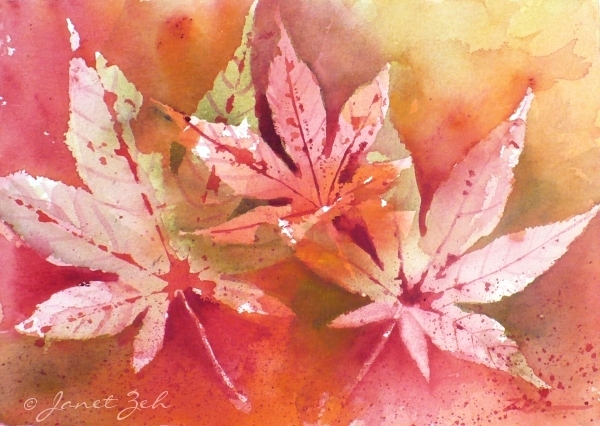 To continue my Autumn Collection, here is a painting using Japanese Maple leaves as templates. They have such a pretty design as they are, and their deep burgundy color is lovely. In this piece, I saved most of the color for the background allowing the leaves to show lighter against the deeper colors of autumn. Below is a video so you can see how I painted this. Painting leaves using real leaves as templates is fun and easy. I've had some requests for a video on how to do this, so here you go! If you try this, let me know how it turns out for you! Your video was so much fun to watch, and the end results are breathtaking! Thanks for giving us an insight into your studio process. Love it, and your art! Thanks so much, Kelli. It was fun to make the video and I'm glad that you enjoyed it and the artwork too! BEAUTIFUL! thanks so much for sharing this technique. Can't wait to try it....without the kooky musical accompaniment...:0) it's hard to dance and brush at the same time. Donna, do give it a try - the painting I mean. I love to dance so painting and music kind of go together, but totally understand how it might cause a problem, lol. Thanks for your nice comment!